Home > Reviews > Oh, to be 16 and in love and in 1986, and hearing The Smithereens for the 1st time. Oh, to be 16 and in love and in 1986, and hearing The Smithereens for the 1st time. A few months ago I mentioned that I wanted to read Eleanor & Park by Rainbow Rowell. Here’s the Kirkus Review that got me so interested. Awkward, prickly teens find deep first love in 1980s Omaha. 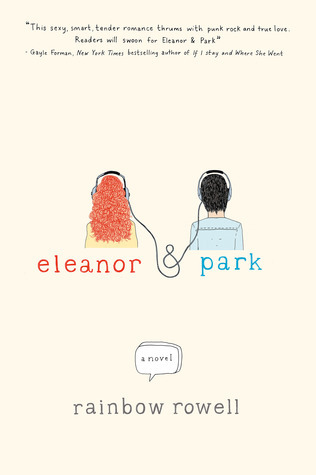 Eleanor and Park don’t meet cute; they meet vexed on the school bus, trapped into sitting together by a dearth of seats and their low social status. Park, the only half-Korean fan of punk and New Wave at their high school, is by no means popular, but he benefits from his family’s deep roots in their lower-middle-class neighborhood. Meanwhile, Eleanor’s wildly curly red mane and plus-sized frame would make her stand out even if she weren’t a new student, having just returned to her family after a year of couch-surfing following being thrown out by her odious drunkard of a stepfather, Richie. Although both teens want only to fade into the background, both stand out physically and sartorially, arming themselves with band T-shirts (Park) and menswear from thrift stores (Eleanor). Despite Eleanor’s resolve not to grow attached to anything, and despite their shared hatred for clichés, they fall, by degrees, in love. Through Eleanor and Park’s alternating voices, readers glimpse the swoon-inducing, often hilarious aspects of first love, as well as the contrast between Eleanor’s survival of grim, abuse-plagued poverty and Park’s own imperfect but loving family life. I finally purchased the book Saturday night, and I LOVED it. Seriously. It has everything – love, humor, tension – and it takes place in 1986 so I got to relive the days when a boy you liked would make you a mixed tape. I think fans of John Green (and who isn’t a fan of John Green) would really enjoy this book. It has some adult themes and language, so I wouldn’t recommend it to younger teens, but everyone else should read this book. And listen to The Smithereens.